I grabbed a bottle of Weyerbacher's Eighteen Weizenbock a few days ago. It was nice to see an anniversary beer sold in a 12 ounce bottle and not an overpriced bomber, though this single was a high end $4. The label is simply decorated with XVIII and the name of the beer over it. 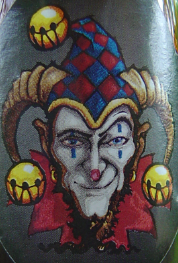 There are little hop and barley accents around it, and the new jester is also on the neck. The bottle cap also is very cool with a W for Weyerbacher on it. Big banana and cotton candy aroma. You will also smell prunes and caramel and know there is booze disguised behind them. The flavors are identical. Lots of bananas, like very sweet overripe ones. Cotton candy sweetness comes next. Then more rich sweet prunes and peaches too. Boozy from the start, thanks to the 11.1% alcohol, and a little hot going down. Yeasty and spicy. Chewy body, low carbonation. This beer went way beyond overboard with the super sweet banana flavors, the overwhelming syrupy texture, and the boozy alcohol. Unenjoyable. I dumped more than half. That doesn't mean I don't love you, Weyerbacher!